Slow words | carpe diem! And partly because I want to share my encounter with some knitting history. The Gairloch Heritage Museum is well worth a visit. After our marathon walk we spent a wet morning trying-not-to-limp (we have our pride) through the linked white-washed buildings, looking at a classic assortment of village odds&ends assembled to tell interesting, coherent stories about the life of Gairloch. Those not interested in local history can examine a real lighthouse lantern (the glass structure that magnified and deflected the light of a single lamp to make it visible for 23 miles) in detail, up close and personal. It’s an absolutely amazing structure. Pictures would make this far more interesting, but the Museum does not generally permit photography; the one I did take required a formal permit. There are displays of old photos, giving both Gaelic and English names of the people (no one could tell me why the different names were given, or when they were used. Sometimes the English was an obvious anglicisation, more often not). The postmen and postmistresses were given pride of place, for they held the network of rural communities together. There’s a tiny village shop counter, a miniature schoolroom. At one end of the largest room a window opens into someone’s house. It’s full of wool. There’s a spinning wheel ready for use, carders and a basket of fleece. The sheets on the box bed are made of old flour sacks, 4 per sheet, covered with handwoven blankets. A handwoven shepherd’s plaid hangs on the wall by the door. In another room a display takes the uninitiated from fleece to sock. Carders again. Fleece (possibly rolags, but I can’t remember now) to be spun stored in the coolest basket, resembling a large, very rotund (American) wicker football with a large slot at the top through which fleece is pushed/removed. There’s a spinning wheel. There’s a display of handspun beautifully dyed using local dyestuffs. There’s a cabinet containing socks and a Sock Top sampler(!! ), a long cylinder demonstrating various options for the tops of socks. Quite different from modern socks: all the ribbing had much wider stockinette ribs (roughly 1″ wide) than purl (1/2″ or less). The socks are thick and long, probably over the knee. All those I can remember were knitted in two colours, in variations of a pattern of diamonds (squares on end) filled with a uniform texture. This is apparently the Gairloch Knitting Pattern. I won’t describe any in great detail, as the Museum sells their own knitting pattern booklets and might object: I don’t want to offend them, I honestly admire what they’re trying to achieve. If they’d like to produce PDFs to sell online I’ll generate them gratis. Here’s part of the photo I took. The display is ostensibly of the wooden sock blockers on which wet socks were dried, but my eyes were drawn to the darns on the well-worn heel and foot. 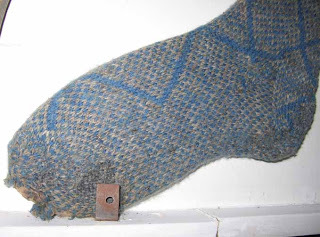 I’d like to think this sock was knitted and repaired with love as well as wool, but I suspect desperation was involved. From the mid-1750s Scots left the Highlands voluntarily or were forced to do so. Life was hard at the best of times in a landscape where every fertile corner was already supporting someone; besides this, the former clan chiefs were becoming ‘Lairds’ on the English model, charging rent for farmland and finding other ways of raising money, such as pasturing lucrative sheep on what had been small farms. The Clearances reached their height at the beginning of the 19th C. Many of those forced off their land had no alternative but to leave Scotland. 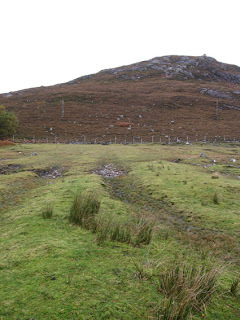 Those who stayed were usually allocated crofts, new land in settlements planned by the Laird. Some crofts were deliberately made too small to support a family, forcing the crofters to work for the Laird to earn cash for necessities. All the small farms had to produce as much food as possible: enter the potato. And, from 1845-1849, potato blight. I hadn’t realised that the Scots crofters relied on potatoes to the same extent as the Irish. of seaweed and bracken with soil and leaving it to rot over the winter. In spring seed potatoes dibbed into holes in the ridges would produce good crops. Usually. “in Gairloch, where the tenants had ‘a little meal [oats or barley] or milk in the season of it’, the food of the poor was herring and potatoes” (Malcolm Gray, The Highland Potato Famine of the 1840s). The resulting famine was devastating. The poverty of that economy is hard to imagine even when you’ve walked the landscape. Most people lived on what they grew themselves, relying on the sale of one or two cows every year for cash. The Lairds of Gairloch were among those who created jobs for local crofters, to be paid in oatmeal. Men worked 8 hours a day, six days each week building ‘Destitution Roads’ such as the road along Loch Maree; for this they received 24oz per man, 12 oz per woman and 8oz per child. What has this to do with knitting? While the men laboured on the roads, the women knitted. Lady Mackenzie of Gairloch even brought an expert from Skye to improve the quality of local knitwear: in 1847 she was said to have over 100 women spinning 490lb of wool per week to be knitted or woven. Eventually she built this into a local industry (more information is in the museum leaflets). Now I’ve got to go and choose(!) what we will enjoy for dinner tonight. Herring and potato aren’t on the menu. This entry was posted in Uncategorized on July 12, 2007 by sarahw. Sounds like my kind of holiday, far more interesting than sitting on a beach! Did you buy any of the knitting patterns? I keep trying to look closer at the sock to see the stitches and pattern, typical knitter eh! Wow, thanks for taking me on your vacation. I find this information so interesting–it’s part of the reason why there are so many Scottish-American types in the USA. They had to go somewhere when that famine happened-and many came to KY. Missed your last post -had assumed you would be beyond the reach of the web! Enjoyed the tales of your adventure. Its a while since I have put house n’all in rucksack & headed upwards so I am full of admiration for your hike in Torridon. We have, however experienced rain in a tent, on our camping safaris to the Outer Hebrides!It is always a good/bad mix -love the sound, love the cosy feel, hate the worry of leaks & the need to pop outside for comfort needs!We went ot the Gairloch museum about six years ago & I remember some of its many treasures. Those socks will defy any misty weather! Love ’em! Thanks for the kind words. I have exactly the same problem with my stepmum, limited -if any visits etc. At least I know someone knows how it is, thanks.